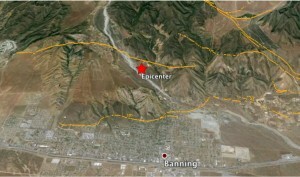 Google Earth image centered on today’s M=4.5 epicenter. The orange lines are traces of the active San Gorgonio fault. The width of the photo is about 8 km (5 mi), and San Gorgonio Pass lies 5 km (3 mi) to the east (right). Faults from the USGS and California Geological Survey.